When I met my husband, everything I owned fit into one purple backpack. We lived for a time in his pick-up truck, camping out in Walmart parking lots, with minimal belongings. And we were happy. A couple years later the unfinished basement of our first home was filled with junk, items we had kept just-in-case, gifts we had no intention of using, things we found at thrift stores and just-had-to-have. Overwhelmed and unsatisfied by the things we had collected, we embarked on a journey to give away over half of our belongings. We dug through drawers, emptied boxes and totes, sent piles of stuff off to charities. We fully embraced the less-is-more life. And I believe strongly that a simpler, minimalist, less stuff-filled life is an act of worship in response to the gospel. The same God who made provision for us today made our neighbour in His image. The God that gave us our daily bread instructed us to share it. But at times, I confess, I looked for more from that simple lifestyle than it could provide. When life felt chaotic and out of control, I would look around for things to purge. I was too often trying to fix internal chaos by controlling my external environment. It didn't work. Friends, decluttering is great. Living with less, giving generously, holding loosely to the things of this world, is a genuine response to the God who desires our hearts. But it wont bring us peace. It won't soothe our souls. Because when it comes down to it, we are still relying on the quantity and quality of our belongings to make us whole. And belongings, no matter how mass or sparse, cannot to that. Whether we hoard items or give them away, the temptation can be the same - to put our faith in our own ability, our material world, our curation of the right set of belongings, to bring us peace. It's still about stuff. It is still setting our hopes and comfort on created things rather than the creator of all things. It is materialism, wrapped up in a sparser bow. As long as our focus is on created things, we will miss the maker of all things who beckons us to himself. Please friend, keep decluttering if you are so inclined. A simple life of few possessions is a great goal. Giving away our excess to those who can use and enjoy it? That is a beautiful way to practice love. But if we are hoping to find peace in those empty corners of our home, trying to stir up some life changing magic by sorting through our stuff, we will be left disappointed and dissatisfied, time and time again. Because nothing short of god can satisfy, not full cupboards, nor empty ones. Just God alone. Good morning, Kelly :) So many of us are downsizing and decluttering as we get "older" - I mean really, how much STUFF do we need? I love to go to craft stores and Christmas sales, I see all this wonderful STUFF, and think "OK, I can buy it now and get rid of it next year". So, I walk away. The STUFF isn't going to change the hardships that people face, the all to common sadness of the holiday season. This is indeed a time of reflection, and your words are right on point ! Getting rid of the STUFF only declutters our closets, basements, shelves and cupboards. It doesn't declutter our hearts. Exactly Debbie! Thanks for reading and commenting! Very thought provoking. . . thank you! Just what I needed to hear at this moment. God is good. Yes, God IS good! Thanks for reading my blog and commenting. I appreciate it. I never comment on blog posts, but this is so good and so true! 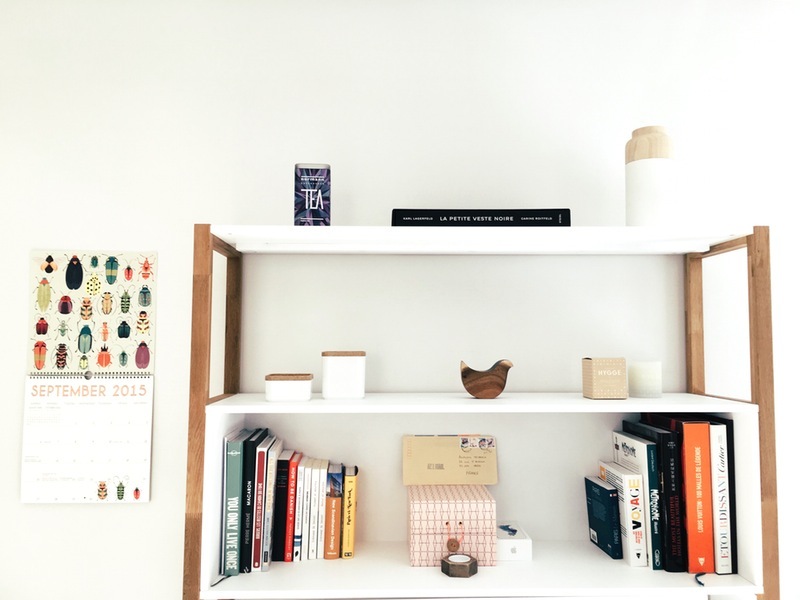 Minimalism to create control (especially for busy Mamas) is such a temptation. Thanks for reminding us WHO we must be doing it for. Blessings! Really great quote! You touched me. 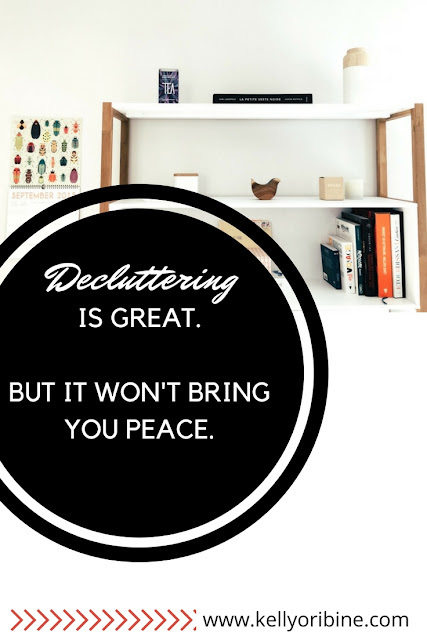 You're right, it's not only decluttering to get the peace we want. Clutter has overtaken our household again and again thru the years. Donating seemed to be an answer. Actually doing some of the saved projects seemed to be an answer. I asked myself one day as I sat sorting stuff out of boxes, "Does God mind all this stuff being here?" I said to myself, "Of course He does because it shows I am not a good steward of our worldly goods." What a judgement. I tossed it out the window and felt the burden of years of condemnation leaving my shoulders. It is in process of leaving the house now because I love my children and don't want them to have to deal with it after I am gone. And that idea has brought some peace.. He shows me what to do with it and we are partners in clutter control. And He is in control of more of me ! Jesus is Lord. Thank you Kelly for this blog. And I love the rag quilt from Jan 2012..will be making one soon.